They tied the knot with western and Indian traditions, including a very big fat Bollywood dance-off. Priyanka Chopra and Nick Jonas just got married over a lavish three-day affair. The nuptials, dubbed India's "wedding of the year", took place at the opulent Umaid Bhawan Palace in Jodhpur. In addition to the usual glitz and starry fireworks, the couple really turned the wedding into something special by making it a coming together of two cultures. And stars like Ralph Lauren, billionaire Mukesh Ambani and his family, plus "Game of Thrones" actress Sophie Turner, who is engaged to Joe Jonas, Nick’s older brother, headed to the western desert state of Rajasthan to witness the different beautiful ceremonies. The power couple, which made their romance public in May, started off with a Christian ceremony. For the white-themed event, Bollywood turned Hollywood actress Priyanka and American singer Nick were dressed in custom Ralph Lauren ensembles. The bride's strapless dress was embellished with over 2 million pearlescent sequins and overlaid with a high-neck coat that had hand-embroidered messages like "Family" and "Hope," which were selected by Priyanka,and satin-covered buttons. The breathtaking creation was accompanied by an ultra-long veil. The American designer, who has previously only designed wedding gowns for his daughter, daughter-in-law and niece, also dressed the bridesmaids and groomsmen. A first dance to Roberta Flack’s “The First Time I Saw Your Face,” a multi-cuisine dinner, cake cutting and a fireworks display followed the ceremony officiated by Nick’s father, Paul Kevin Jonas Sr.
Before arriving to Jodhpur, a puja ceremony was held at Priyanka’s family’s home in Mumbai to spiritually celebrate the upcoming event. And after the Christian ceremony, the duo, who got engaged in July, enjoyed a traditional Indian Mehendi ritual, where the bride applies henna on her hands as a sign of matrimony. "One of the most special things that our relationship has given us is a merging of families who love and respect each other's faiths and culture. And so planning our wedding with an amalgamation of both was so amazing. An important part for the girl in an Indian wedding is the Mehendi. Once again we made it our own and it was afternoon that kicked off the celebrations in the way we both dreamed,” they wrote in identical social media posts. Priyanka, 36, was dressed in a bright, folksy, 48-multi-panelled organdy sherwani embellished in silk detailing. The multi-coloured creation and heirloom jewellery she wore for the ritual were designed by Khosla Jani. Abu Jani and Sandeep Khosla, the forerunners of India’s high fashion industry, were also behind Nick’s aqua Mehindi outfit, an embroidered Banarasi cotton bakhiya kurta. The traditional choora, when bangles are presented to the bride by her maternal uncle, and haldi, that sees family apply turmeric paste to the bride and groom to ward off evil spirits, also took place. The luxury hotel's Mardana Hall was beautifully decorated with marigolds, while the colour theme for this function was pink, orange and purple. The same evening, there was a glittering event with dance and musical performances by friends and family. The theme of the sangeet ceremony was ‘Boys Vs. Girls.’ During the dance competition between the two families, Priyanka performed “Ram Chahe Leela” with her mother, Madhu Chopra, while another song, “Gallan Goodiyan,” which is from one of her movies, was another big hit. Family and friends also acted out the story of Priyanka's life and relationship with her groom. The evening ended with a gorgeous fireworks display. "It all began as a fierce song & dance competition between the families but ended, as always, as a huge celebration of love. Nick and I were looking forward to the Sangeet (musical evening), another pre wedding ritual ... and to see what each side had put together," Priyanka, who won the Miss World 2000 pageant, posted on Instagram. "And what a performance it was. Each family telling our stories through song and dance, filled with lots of laugher and love." For the Hindu wedding ceremony, the “Baywatch” actress wore a lehenga in traditional red, which is a sign of fertility, prosperity and maturity in the Indian culture. The custom outfit featuring hand-embroidered and hand-cut organza flowers is by one of her favourite designers, Sabyasachi Mukherji. The lehenga, which took 3,720 hours to create, also had French knots in silk floss, delicate Siam red crystals and oodles of embroidery. Priyanka's wedding jewellery was made of uncut diamonds, emerald and Japanese cultured pearls in 22 karat gold, as well as uncut diamonds in tiny star shapes. The 26-year-old Nick, who has also turned to acting, was dressed in a traditional outfit by the same designer. 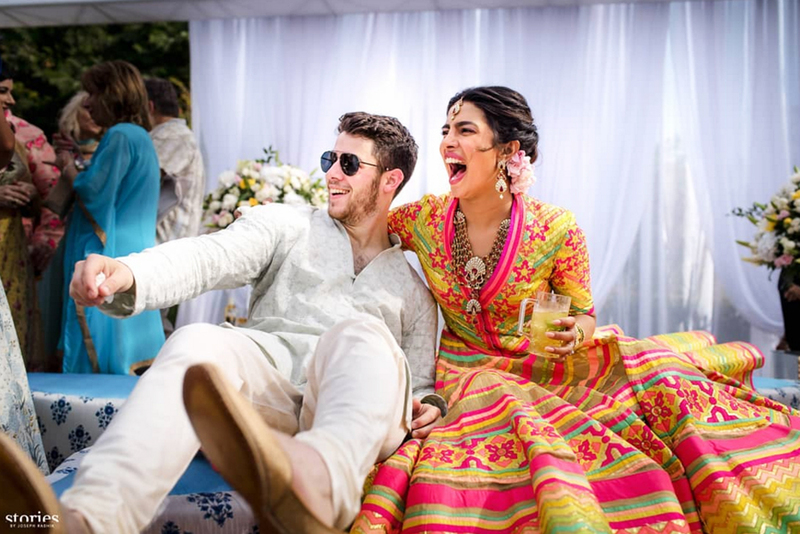 The frontman of The Jonas Brothers even went as far as arriving atop a decorated white horse holding a sword for the baraat and taking an elephant ride with the bride. The ceremony typically includes the varmala, when the couple exchange garlands, prayers and a saath phere, which sees the bride and groom walk around a fire seven times. An elaborate dinner and after-party followed. Invitees who stayed at the venue that can be hired out for $60,000-a-night were lavished with special gifts, including personalised silver coins featuring Lord Ganesha and Goddess Laxmi and Indian treats. While enjoying the festivities, they were able to take in the wonders Khosla Jani had conceptualised, visualised and designed for the wedding, including a 40-ft high canopy adorned with red flowers, black and gold decorations for the alfresco Sangeet party and a wishing well tree for hanging up notes. Additionally, the newlyweds, who chose wedding bands by Chopard, are holding a grand reception in Delhi’s Taj Palace Hotel on December 4 and another reception for their industry friends at a later date.